Europe is in deep trouble. European Space Agency (ESA) Director General Jean-Jacques Dordain said on Friday that it will cost 1 billion euros ($1.35 billion) for the Ariane 5 ME upgrade, which will allow the rocket to carry large payloads by 2018. The upgrade is needed to allow the rocket to keep up with the growth in the size of communications satellites, which Ariane 5 launches in pairs. While that project is going on, it looks like Europe will have to find an addition 3 billion and 4 billion euros ($4 to $5.4 billion) to fund Ariane 6, which is set to enter service in 2021. The new rocket is being designed to launch single communications satellites into orbit for no more than 70 million euros ($94.7 million). Meanwhile, SpaceX is marketing its Falcon 9 booster at the rock bottom price of $56.5 million. The California company also plans a test launch of its Falcon Heavy rocket later this year, which it will market at prices ranging from $77.1 million to $135 million depending upon the weight of the cargo launched. The Falcon Heavy would be capable of launching pairs of communications satellites into geosynchronous orbit just like the Ariane 5 does today. However, it could do so at a significantly lower price than its European competitor. SpaceX is also experimenting with recovering and reusing the Falcon 9 stages. The eventual goal is to bring launches down to between $5 to $7 million per flight. If the company can achieve that goal (and its not clear whether it will), then the entire launch market would be upended. By the time ESA finishes with either launch vehicle project, SpaceX may well succeed in rendering both rockets uncompetitive with a fully reusable Falcon 9. Europe’s launch vehicle strategy has all the markings of fighting the last war. It will eventually get to something akin to the Falcon 9 early in the next decade. Meanwhile, an increasingly confident SpaceX is leaping ahead with bold innovations that ESA is not even contemplating. But apart from all those bullet points, it’s going well? Yes? It’s funny to reflect, that if you look at the long history of commercial reforms to the space industry (going back to Reagan in the 80’s), it was the threat of European launchers that helped initiate the whole thing. 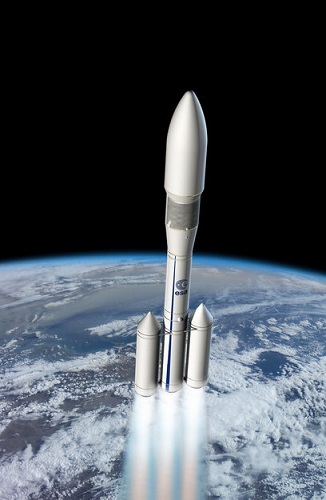 It’s not certain that both Ariane 6 and Ariane 5 ME will be developed. Ariane 6’s internal launch costs do not have to be lower than SpaceX’s, because ESA is not a standalone commercial company. Ariane 6’s costs have to be low enough for it to be offered at a competitive price, without requiring too much in member-nation contributions. Do not make the Boeing-Airbus mistake of thinking the European model cannot compete with “free-market” pricing or innovation. One other factor, not mentioned but likely crucial, is what launch rate are they using to project their costs? Ariane 5 really needs to dominate the current commercial launch market in order to get enough launches to “amortize” its massive industrial footprint down to a semi-reasonable cost. Ariane 6, with a much smaller footprint, may be able to maintain its cost structure even as it shares the market with a growing SpaceX. And share it will, because whatever Ariane is available will continue to get launches from the Galileo and Copernicus constellations, loyal customers, and for a host of other reasons. With regard to reusability, that could be revolutionary, if the market expands at the rate necessary to make it pay off. But if it is successful, competitors will quickly incorporate it into their vehicles, too, with the advantage of knowing one scheme that works and the ability to improve on problematic aspects. “Pioneers get the arrows,” as the saying goes. For the launch industry, it would be a permanent revolution; for SpaceX, it is merely a short window of slightly enhanced profitability. With regard to development program price, I don’t know that it is important. History of full of examples where less-efficient gargantuan incumbents crushed nimble, efficient upstarts. It’s worth pointing out, too, that Orbital didn’t actually complete a sustainable manufacturing infrastructure, which they will have to do to maintain Antares. So much of the new space hope rests on accomplishments by just one company, SpaceX, and really on Elon Musk’s financing and vision. (Five years ago, I would have included Scaled Composites.) For long term sustainability, we (space enthusiasts) really, really need (several of) Virgin Galactic, Blue Origin, Orbital’s Antares, XCOR, and SNC Dream Chaser to make it to profitable operations. And preferrably profit independent of NASA contracts. Right now, if some hole swallowed SpaceX, every one of the others is a long shot for viability. Surely for all the discussion of how SpaceX undercuts other launch providers and that the Falcon reusability will be a game changer there is one point that keeps being missed out. Simply there aren’t that many spaceports in the world. Even if SpaceX monopolised the entire launch market, at the moment the Falcon 9 can only launch from the Cape and Vandenberg, there are a limited number of launchpads and any flight delays causes an already huge launch manifest to be delayed even further. Even if SpaceX undercuts everyone, people will still choose to fly payloads from French Guiana and Baikonur with other rockets simply to ensure they’re not pushed back further and further down the waiting list. With the acquisition of the former shuttle pad as a second site in Florida, and plans to develop a whole new range from Texas within a few years, this doesn’t appear to have been neglected. The subsidy point is a key one to remember when trying to predict what decisions may be made by ESA in December. At that level, these are decisions of the member Governments and most will judge it on its merits as an investment. When the price tag represents a poor return, ESA does have a history of abandoning projects. The other factors that weigh into this are national industrial policy (which in Europe isn’t as simple as a “jobs program”) and defence needs (see France). The European and the probably the ULA need to rethink their outsourcing/distributed manufacturing practices of making pieces of their products all over the continent, and launching it at another continent across the world. When even the North Koreans and the Iranians can build their own satellite launchers, it kind of mean that the rocket industry is no longer a specialized field like before, and it’s slowly being turn into a commodity, and bring it all under one roof(the Skunk-work philosophy) and cut out the added-on profit margins of the engine maker, the avionics manufacture… just make more business sense for something that is being commodified. Oil prices and rising transportation/logistic cost of moving all those pieces around can’t be cheap.. I think it was deeply symptomatic that they settled on an all-solid first stage for Ariane 6. Back when the first news broke, I pointed out that it had no potential to being made cheaper, let alone reusable. They chose the configuration in question because they tried to make the development cheaper, yet risk-free, by re-using the legacy capabilities instead of building new capabilities with a built-in perspective. Europe’s launch systems will be in the same condition that America’s has been for the last 20 years. IOW, the only thing that will keep it alive, will be their govs. and maybe some of their businesses. Sadly, the way out is via Skylon and Sabre. But, Europe is not going to do it. So, they will go the same route as what America did (bad choice). However, Europe is not the only nation in trouble. So is Russia and China. Russia is in the process of a new system, which very likely will still be far too costly. Now, China’s is also far too costly, but China’s gov will do what they do with all business: subsidize it in hopes that they can destroy the west’s businesses and then quit subsidizing it. Japan is being smart about it. They are re-evaluating everything. Now, what is interesting is that ULA is also in a mess. Yet, they are not doing much, but hoping that the feds will continue to subsidize Delta/Atlas, while at the same time, hoping to have the neo-cons kill off SpaceX. America’s right path would be to hold a new COTS but for 2 SHLV. We should kill of the SLS right now, and simply pay for 2 companies to do a SHLV. If they both make the right choices, then they will within 4 years have new systems that are dirt cheap, and capable of competing in the world market. Hopefully, neither of them would do a OSC type approach of building nothing, simply assembling others work (like atlas did) and then charging top dollars for it. ESA will carry on as it always has and will eventually decide upon a logical path after many many many committee meetings/forums/discussions in the press oh and not to forget telephone calls and emails/teleconferencing…. e.t.c. In the mean time SpaceX will I’m sure sail on by. This is just a case of cost versus dogma, I have no doubt ESA will get the point eventually. And they have secured the funding for this project. are easily going to be 200M$ in 2022. The problem is that ESA is just a multi-national organisation. This means that each member state will want a piece of the pie, they each want to keep people employed building these rockets. This is no different that a bunch of US congressmen keeping SLS going in their districts… jobs! At some point European Ministers, and ESA, and everyone else, is going to have to face up to the prospect of spending 4 billion euros on a launcher with a projected launch cost of $95 million that has to compete against F9R with a launch cost of $5 million (at least below $30 million by 2022). That’s the problem, it will not be competitive, nowhere near it. In fact it will be ridiculously uncompetitive and all in a technologically retarded design that can only become more of a liability going forwards. By being successful in the launch market, SpaceX gets to solve the reusability conundrum without risk. It is not beholding to make profits for the benefit of shareholders and stakeholders. The only way to get the market to expand is to reduce costs through reusability. And if competitors also develop reusable systems, then that should expand the market even further. The direct comparison doesn’t stand. The proportion of work that ESA awards to member states closely matches their financial contribution to the project. They get back what they pay in. For the SLS and similar projects, the funding is federal and represents money coming into the district from others. To be comparable to ESA, the congressman’s own district would have to pay for any contracts he wins. Just in the context of this story, it is worth noting that Guiana itself is an important asset unique to ESA. If all launch vehicles and costs were equal, ESA would have the competitive advantage by virtue of geography. The only country with more potential is Ecuador, which can offer high altitude as well as the equator. Thanks for pointing that out, I’d totally forgotten about those developments. Considering the timescale listed for Ariane 5ME and Ariane 6 I guess my point is made moot in regards to launchsite availability. I still question SpaceX’s ability to clear its launch manifest for the foreseable future though. We don’t know if they can stick to the price. H-3 is a fairly expensive hydrogen rocket, although it is a large advance over H-2A in respect to costs (in particular in manufacturability of main engines). I’m VERY much hoping, if successful in the reuse development, that SpaceX will keep pricing similar to the current levels (i.e. ~80% of current, instead of rock-bottom cost plus pricing) Keeping things somewhat competitive will allow for more overall innovation. Not to mention that SpaceX will bank gigantic reserves to continue their aggressive R&D. Private entrepreneurship vs. state subsidized endeavors. It’s Vanderbilt vs. the Livingston-Fulton all over again. And it was the private entrepreneur who won that battle. If this is not ready until 2020, and it is solid/liquid based, it will still be far too expensive. Based on the speed that SpaceX is moving at, by 2020, probably 2018, SpaceX will be costing $5-7 million. That will not matter. What will matter is that ESA’s problem are rooted in politics, the same as NASA’s ability to build launch systems. Government bureaucracy, meet private enterprise. I can’t wait to see what our new government bureaucracy does for health care. The obvious solution is to have the EU government destroy or delay SpaceX through regulation, law, lawsuit or whatever it takes. Europe’s problem are of course political in nature, ESA is after all a coalition of multiple Governments. What should be understood, is that it is a very different organisation to NASA and the way it functions within the US federal government. Even as a (mostly) European organisation, it’s not part of or affiliated with the European Union, Parliament or other political institutions. I’m a mid-atlantic citizen. I have dual nationality and have lived and worked in both the US and multiple European countries. I find the assumption the Europe’s problem are no different to America’s inaccurate but frequently repeated. In some ways, the ISS global coalition is a better model to understand how ESA operates. The motivations can vary from country to country, and the solutions are not black and white. Just looking at the comments above yours, Stuart, I see a hell of a lot of dogma on our side of the pond. They chose the configuration they have because France is making by far the biggest contribution, and needs to produce solid rocket motors for its nuclear defence. They are trying to impose (proposing) ISO standards on all rocket launchers. This may yet happen. How will they incorporate it quickly? The SpaceX boost-back and propulsive landing technique *cannot* be just added on to any other current launch vehicle for a simple reason – throttle range. The F9, thanks to having 9 engines, is able to land with an effective 10% throttle. All other 1st stages out there use only one engine and cannot throttle down far enough, or use multiple engines without a central one. There are of course other ways of reusing a first stage (fly-back, or parachute recovery being two examples), but my point is simply that competitors won’t simply be able to copy the SpaceX approach and slap it on their vehicles as you are implying. They will have to do re-usability some other way. Blue Origin is the only near future competitor which will be able to use a similar approach to SpaceX. Politics and space agencies, can one survive without the other? Sadly not yet. Yes, keep an eye on the Japanese, they may well pull something out of the bag…. I have a feeling some countries might well be “treading water” watching SpaceX and the Grasshopper project closely before as if by magic announcing their own Grasshopper project. oh, I suspect that companies like Masten and Armadillo will suddenly have large amounts of money thrown at them from other nations. As it is, ESA is going after DC. that is why the push for private space combined with a board to control NASA. We are trying desperately to divorce politics from space and science. The problem is that the neo-cons and tea* will fight that since these sub-groups have no real belief in science. And yet, it was NASA, that helped make SpaceX what it is today. Without that ‘Government bureaucracy’ from NASA, SpaceX might be launching F1’s, but more likely, would be gone. And health care is not involved in Obamacare. That is all about insurance and gov. debt, not health care. Then Eu would simply help elect a bunch of neo-cons to accomplish that. After all, that is what they are desperate to do. While I’m very impressed with SpaceX and I hope they drive the cost of launch way down, don’t go cancelling your space programs just yet. Remember the fiasco after when the shuttle was promised as THE ONLY space launcher you’d ever need or want? We were even going to FORCE payloads to only launch on it. We think we understand all the compexities of the launch market, but until a product has proven itself, it would not be wise to end all other current activities. Oh, I did not assume that your politics is the same as ours. BUT, it is still politics that strangles both of our space programs. One thing that I have noticed about ESA’s and each nations contribution is that it is based on what technology those nations want to go after. That is the way America used to operate. Now, America is about getting short-term jobs without a thought about the long-term issues. The SLS is sadly a perfect example of that. So is the neo-cons pushing to keep open the M1A2 production when our DOD is desperate to stop it and move on to a new design. that is exactly why I think that SpaceX will go along with Bigelow Aerospace charging a single price for being on their station, but, having SpaceX subsidize the other launch systems for a time. For private space to really take off, we need multiple private companies. And the only way to get that, is to make it possible for others to compete. That is also why I support the idea of killing SLS, but then creating a COTS-SHLV for 2 launch systems. That would enable us to go to the moon and mars cheaply. the idea is NOT to stop all others, but to have multiple approaches that have similar costs. Right now, EELVs are expensive, esp. the way that they are designed. And for American companies like ULA’s atlas, and much more so for OSC, they are producing very little of ‘their’ launch system. They will need to return to what they were, which is what SpaceX is, and bring all manufacturing back in-house to be able to compete. well, there are a LOT of companies and ppl that scream that Tesla has an unfair advantage while ignoring the fact that we massively subsidize American oil. That is a good observation, and a reason why I correct people that describe ESA’s decisions as jobs based. The interests of the member states tend to be in developing technologies and industries. That ultimately may create jobs, but it’s industry and technology based first. They don’t pick solutions based simply on them creating the most jobs. The original proposals for Ariane 6 divided down very obvious lines. France wanted solid, Germany wanted liquid. France is the major contributor, and even without a space program would still require the ability to make large solid motors for its submarine based nuclear defence. Germany will support them if the overall numbers are good enough (they don’t have to be great), and in turn Germany receives something it wants. The ESA members don’t win as such, they barter. However, I now doubt that anyone will be able to make the numbers for Ariane 6 work come December, and they will rethink. I think that the neo-cons and tea* have their share of supporters here too. I have perceived a bit of “government bad – free enterprise good” attitude among some posters. I highly doubt neo-cons want to eliminate spacex. They enjoy seeing government programs privatized.